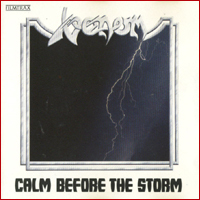 By the second half of 1986 Venom were hard at work on their next album, which had already been given the tentative title of Deadline, when things started to go quite horrendously wrong, resulting in a great deal of infighting which ultiamtely culminated in Mantas going off to do his own thing. Mantas was replaced by two guitarists, Jimmy C. (Jim Clare) and Mike H. (Mike Hickey). The new line-up recorded Calm Before The Storm for RCA, subsidiary Fimtrax, which was released in november 1987. This album completely abandoned the oldschool Venom sound in favour of a more upbeat traditional and mainstream simplistic thrash metal approach. Gone are the pentagrams, inverted crosses and satanic lyrics. This is one of the most atmospheric albums that Venom has ever made. The music is played with a variety of sounds and the new guitarists' technique is polished and dirty at the same time. A great record, but diapproved by many Venom fans because it lacks the dark mood and blasphemous lyrics of their previous albums. The best tunes here are the opening track, Black X-mas, which sounds more like the original Venom did, the aggressive thrasher Metal Punk, the somewhat commercial Under A Spell and the powerful titletrack. But best of the best is the awesome Chanting Of The Priests, with a catchy chorus and great rhythms. All tracks mentioned is from the first side of the vinyl. And as Calm Before The Storm moves into its second side, the new direction Venom has taken becomes more sharply defined. Guitars uncoil like whips, Abaddon´s drums pound at the innards and Cronos perfects his trademarks OOOOOOAAAAAR. But the tracks are a little less memorable. Now some 20 years later - time has actually treated this record rather kindly, and although far from their previous masterpieces, it does show that this much-maligned lineup were musically very adept.